Tim-21's organic allies are starting to grow fearful of their prospects for survival once the rebel robots of The Hardwire are done probing Tim's memories for proof of a mechanized afterlife - a server where the memories of all dead synthetic life go! Meanwhile, Andy and his party of Tim-21's friends have troubles of their own dealing with they cyborg cultists known as The Between. I can't say enough good things about this series. Jeff Lemire puts a unique spin on story elements that might otherwise have been sci-fi cliches and the introduction of robotic religion in this issue is another idea I have seen done before but not so well as it is done here. 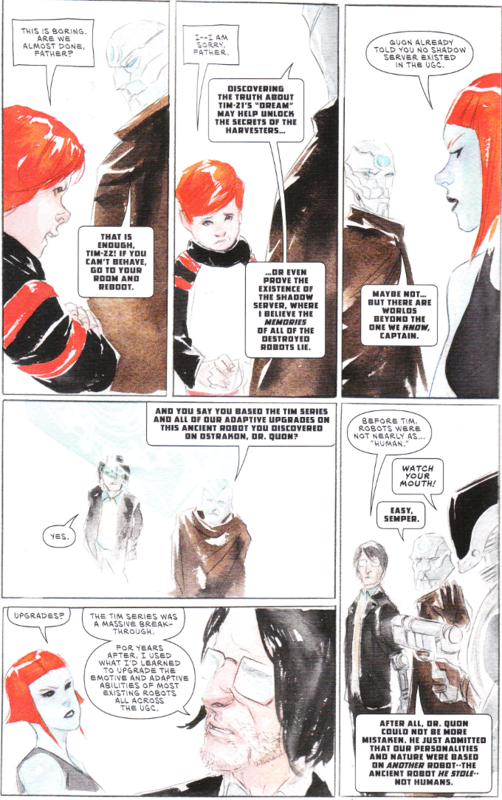 And Dustin Nguyen's artwork continues to be as individual and memorable as Lemire's scripts.